When I was working to bring touches of summer to the inside of the house, I kept thinking about summers spent at sleep away camp, the beach and with my farm family. But you know what I was thinking when I was working on the front porch? World War II. It seems an unlikely source of inspiration until you consider my family is in the midst of planning a very special 90th birthday party. Something about the way everyone banded together for a common cause makes me feel really blessed. I know there were overwhelming sacrifices. 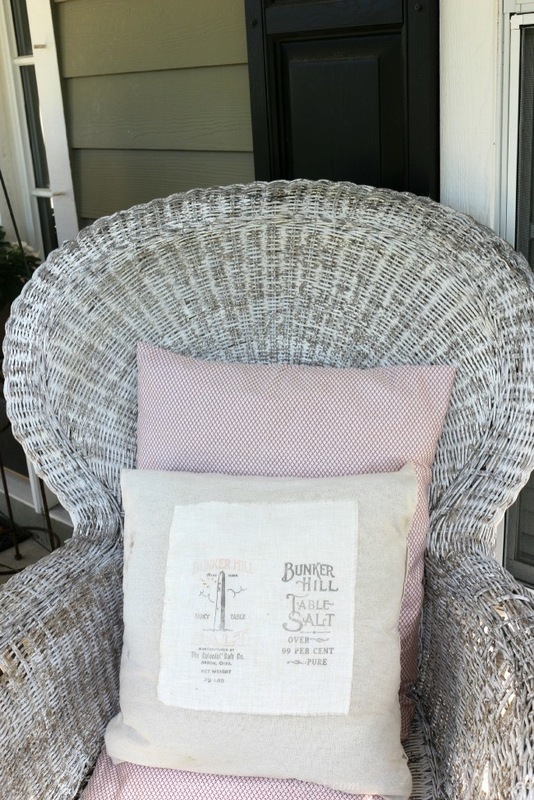 Victory gardens, flour sacks, simple ticking, using things I already had at home and strengthening friendships became the inspiration for the summer porch. 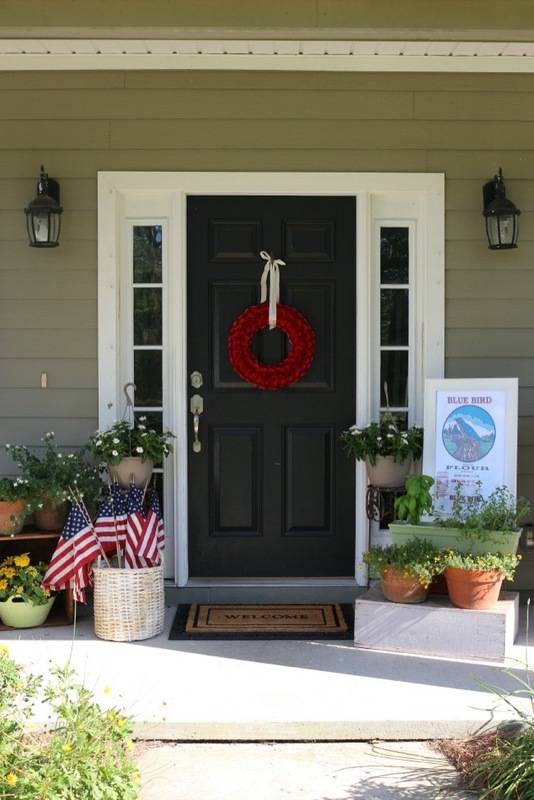 I bought the red wreath at a Country Living Fair 3 or 4 years ago in Georgia. It’s been a really versatile piece. I found the flour sack towel at Mount Dora and framed it with a frame from Hobby Lobby. It used to hang in the kitchen until we created the coffee bar. All of the yellow zinnias were on the back porch but I brought them up to the front because I know we still have men and women to bring home. It’s hard to tell but the box on sitting on its side is actually an ammo box my mom found for me last year and is still one of my favorite pieces. 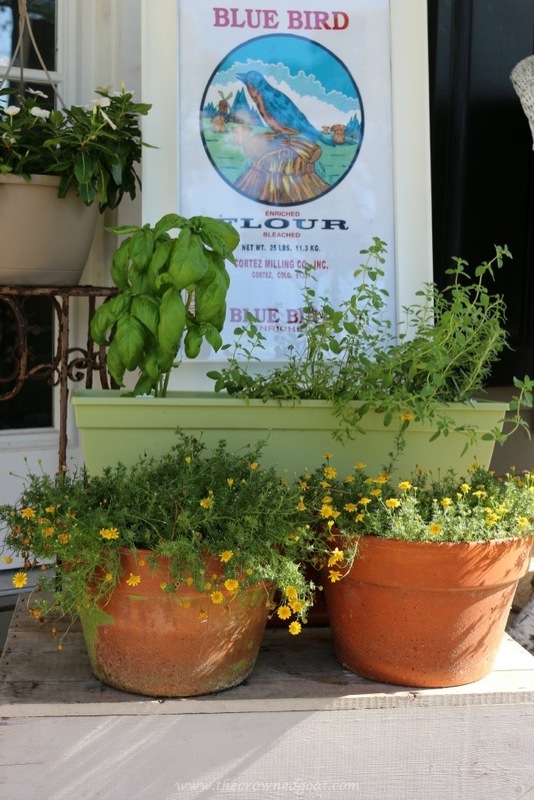 Now that we have the table on the front porch, it’s been a fun place to have brunch on the weekends. I’ve had all of this ironstone for a while now. I brought the blue flowered napkins home after a trip to the cabin last year. I love ticking so using both the blue and the red seemed like a given for the pillows. 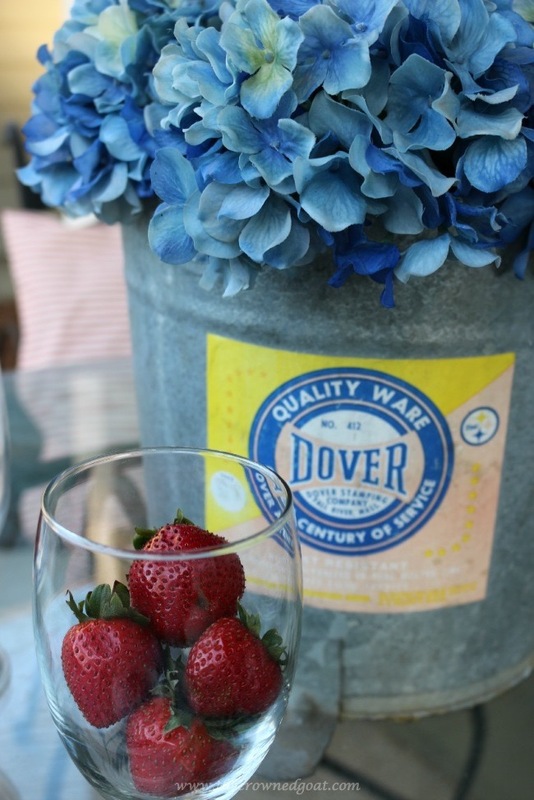 I love old graphics, which made the Dover mop bucket a perfect centerpiece choice. I still haven’t given the old trunk a makeover. I have a few ideas but nothing I’m super excited about so until something really strikes my fancy I’m just going to leave it. It’s been a great coffee table. It gives me the giggles to read through this old cookbook. 1950 is the copyright and the “kitchen of tomorrow section” shows a white kitchen with a large island. I can bake like nobody’s business but ask me to boil an egg and I have to look up the directions. I do want to try some of the recipes this summer though. 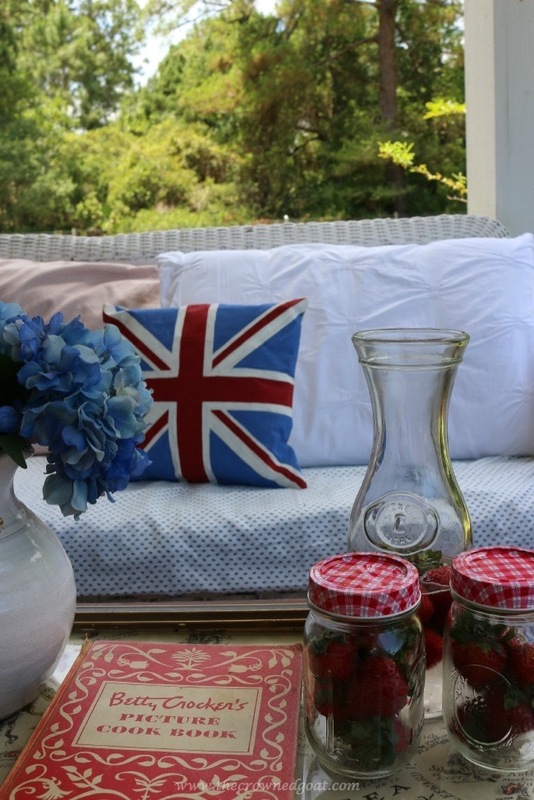 The blue and white fabric on the couch is another favorite thrift store find and my sister LiLi made the Union Jack pillow for me one Christmas. I’m on the hunt for another chair to use on the front porch. I’m hoping to find a wicker rocker. I thought I had found one on a shopping trip with my Mom last weekend but it wasn’t in great shape so I had to pass. I don’t think this chair is going to hold out much longer. If my grandparents walked into my house right now and saw the vintage scales, the quilts, framed flour sacks, bits of ironstone, ticking fabrics and Ball jars they would hardly believe those items are actually cool. For them, these items were just a way of life and that makes me treasure each one even more. See you guys back here tomorrow. I’ve teamed up with some special ladies on a stain project. 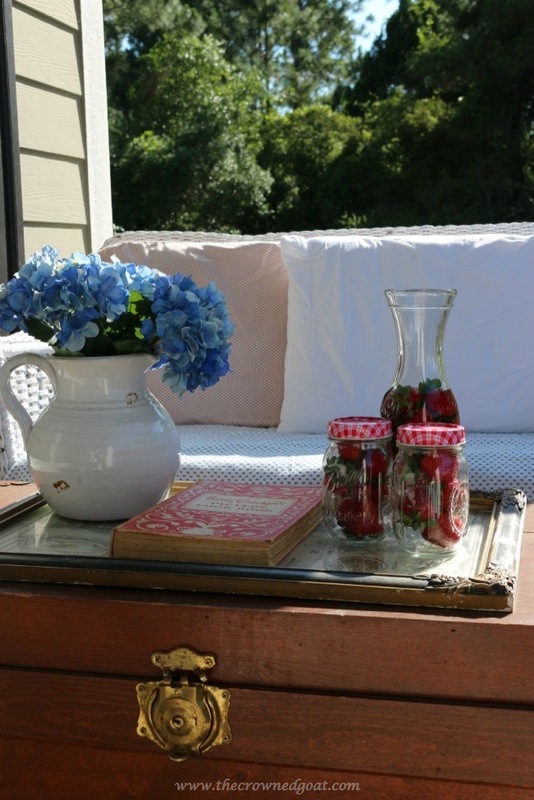 Dear CoCo – We love the spirit that you have captured for your Summer porch! Everything is so meaningful and special. Great sacrifices were made on the homefront “back in the day” and we can see why you treasure those items most. Great job. Cheers to a great day! 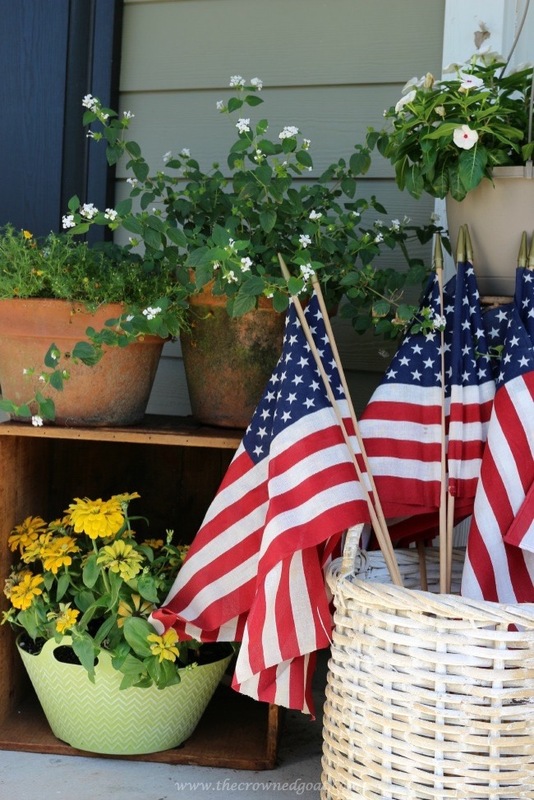 I love your red, white and blue inspired front porch. It looks so inviting and fun. 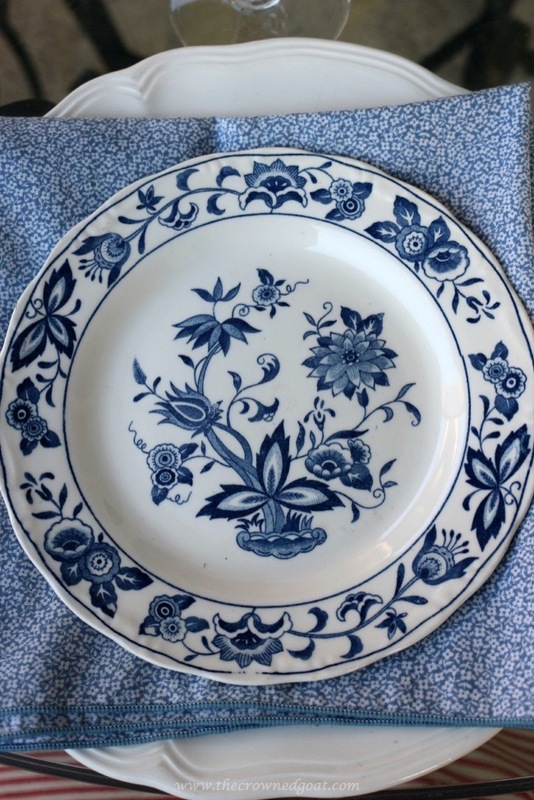 And the blue and white ironstone is gorgeous. Have a wonderful day my friend. It’s lovely Coco especially with the great story behind it! I appreciate your sweet words, Maya, thank you! I just LOVE summer! 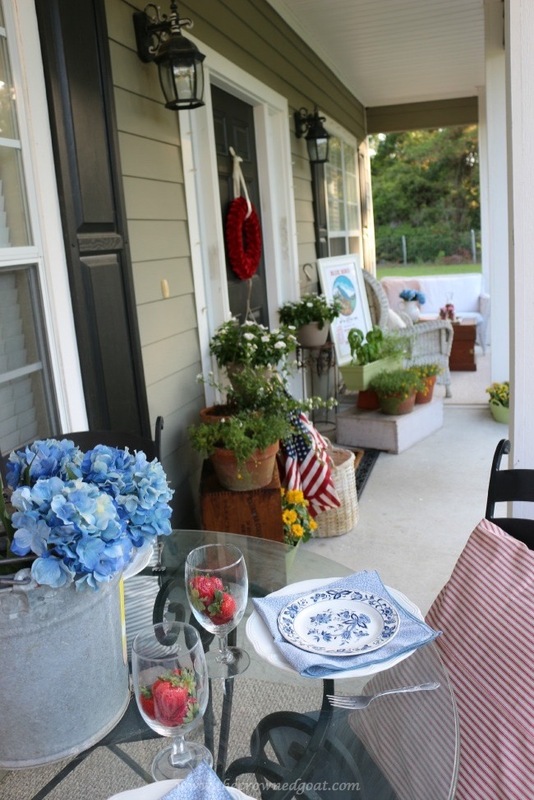 Ypur porch is beautiful and has all the touches that make summer so wonderful! I def got some great ideas! 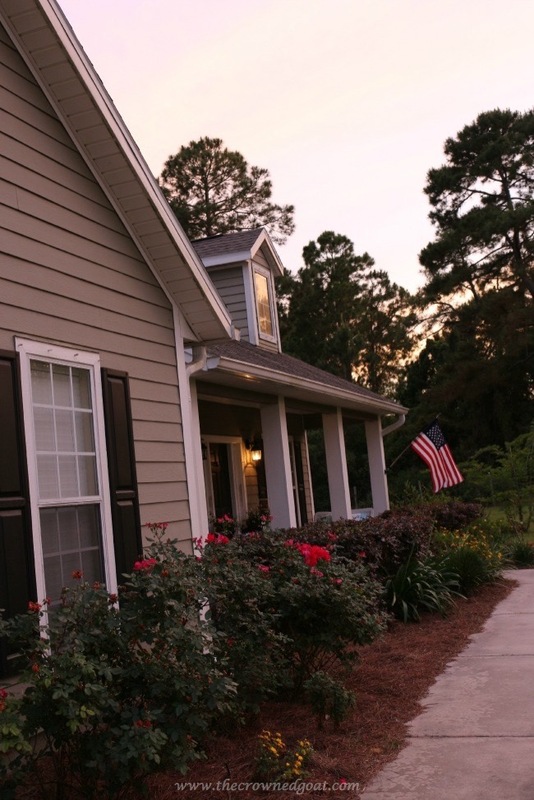 Thank you for inviting us to this wonderful porch of yours! You went over the top with the entire setting! Your porch is beautiful, CoCo! Love the nighttime shot especially! That pillow is lovely… Looks like. The perfect place to relax! Thanks for linking up at Your Turn To Shine! I featured your dining room today 🙂 Enjoy your weekend!